We are proud and delighted to be part of this important redevelopment at the Dean Clough Mills – Halifax. This marked the last phase of a successful regeneration story for Halifax’s historic Grade II-listed buildings, giving a new life to an important part of the town’s history. The full strip out and refurbishment of the buildings created 73,485 ft₂ of contemporary office space over five floors. This project presented several challenges, from the accuracy in drawing and survey works, the fabrication also the erection. Working within the existing stone building, the new floor beams were carefully installed to both mills. 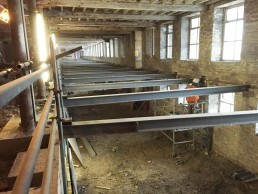 Further works consisted of the new steel frame lift shaft and stairwells and the plant frame to the rear of the mills.